Today the Institute for Veterans and Military Families (IVMF) announced three special opportunities for veterans, military spouses and veteran-owned businesses. The programs include convening Fortune 500 leaders to discuss supplier opportunities during National Veterans Small Business Week and two innovative business competitions: the VetSmallBiz Growth Challenge and the Virtual Elevator Pitch Competition. These programs add to the IVMF’s portfolio of premier initiatives created to empower, train and support veteran entrepreneurs. Through programs including Boots to Business (B2B), Boots to Business Reboot, Entrepreneurship and Veteran Women Igniting the Spirit of Entrepreneurship (V-WISE), the IVMF has trained over 50,000 potential and practicing veteran entrepreneurs. The 3,300 graduates of their EBV and V-WISE programs alone have generated more than $329 million in revenue. The new initiatives demonstrate IVMF’s expanded commitment to helping veterans, service members in transition and military spouses create and sustain successful businesses. During National Veterans Small Business Week, the IVMF will bring Fortune 500 company representatives to National Veteran Small Business Engagement Nov. 1, in Minneapolis. In its sixth year, NVSBE directly connects Veteran-Owned Small Businesses with Procurement Decision Makers from the Department of Veterans Affairs, other federal agencies, state governments and large commercial firms with small business needs. The IVMF session “Building Your Business Through Private Sector Sourcing” marks the first time the large private sector companies will present at the convention. Federal contracting is a $500 billion a year market, with the private sector sourcing much larger than that. Despite this, business sector sourcing is seldom tapped by veterans. Senior executives from First Data, JPMorgan Chase & Co., Johnson & Johnson, Lockheed Martin and Walmart will share information with veterans on accessing the corporate supply chain. 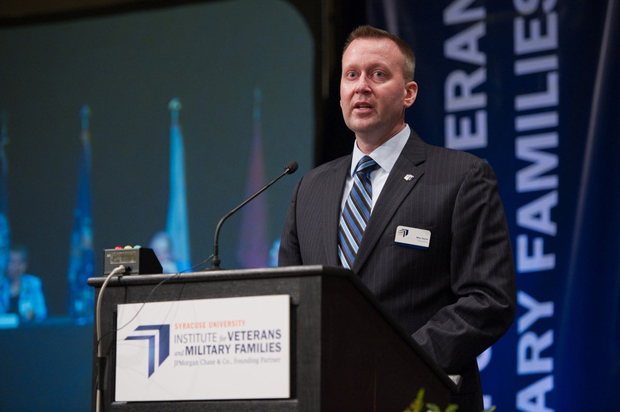 The IVMF will host the session through its Coalition for Veteran-HYPERLINK “http://veteranbusinesscoalition.org/”Owned Business (CVOB). This national initiative supports the success of veteran, service member and military spouse-owned businesses by connecting them with small business resources and solutions as well as commerce and supplier opportunities. For more information or to register for this session, visit the CVOB site. The VetSmallBiz Growth Challenge is a national competition offering recipients elite coaching and business capital with a first place prize of $50,000. It is offered through the support of the Marcus Foundation and is open to all U.S.-based veteran-owned businesses. Winners will receive exposure to a distinguished judging panel and up to three months of individualized coaching in addition to the prize money. The application deadline for the contest is Dec. 10. Visit the VetSmallBiz Growth Challenge for more information. The Entrepreneurship Bootcamp for Veterans (EBV) and EBV-Families (EBV-F), with financial support from Prudential Financial, are sponsoring the Virtual Elevator Pitch Competition. Graduates of EBV and EBV-F are challenged to give their best 90-second elevator pitch for a new innovation, current product or business service. Graduates are asked to submit their pitch video by midnight, Nov. 4. The top five pitches receive between $500 and $4,000. For more information on the IVMF, visit https: ivmf.syracuse.edu.